The Jude Pendant is the newest addition to our line of custom quality reproductions by our in-house design team (and, of course only available at RENEW Gallery). Owner Judith Cohen collaborated with our in-house design team to develop what we think, is just the sweetest crystal drop pendant on the market. 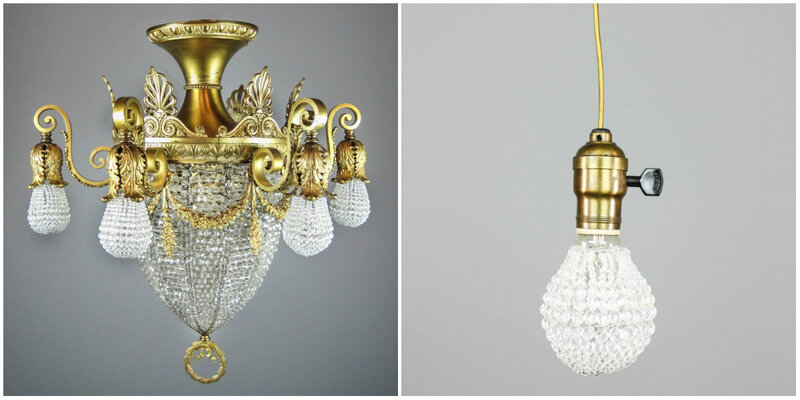 “I was really in love with the crystal ‘socks’ we ended up restoring our antique Crystal Basket Flush Mount Chandelier with, and thought, ‘hmm there’s an idea there’ ”. Going over her thoughts with the design team, the Jude Pendant came out of a move towards minimalism industrial and modernism that still had its root in the elegance of antique chandeliers, “I just loved the warm twinkle of the crystal beads, and the simplicity of a single bulb pendant – the beauty is in the materials…”. 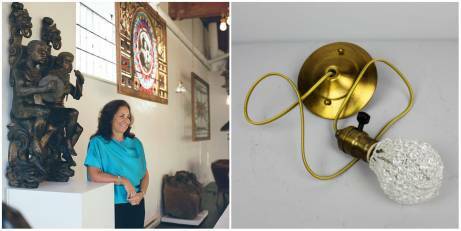 This hand assembled pendant light uses a knotted woven gold cord suspended by antique olive bronze hardware. The socket can be switched on and off by the integrated switch and fitted with an Edison-style or clear bulb. What sets this pendant apart is the crystal beaded “sock” which wraps the bulb and takes on a jewel-like quality when lit. A wonderfully refreshing take on the industrial trend, adding just the right amount of polish, sophistication and light to enhance any interior design concept.